And I show the first picture that isn’t actually quite finished because its too early to plant: the vegetable and herb garden. The vines are the grapes that we have had to make our wine with for the past 4 years or so. 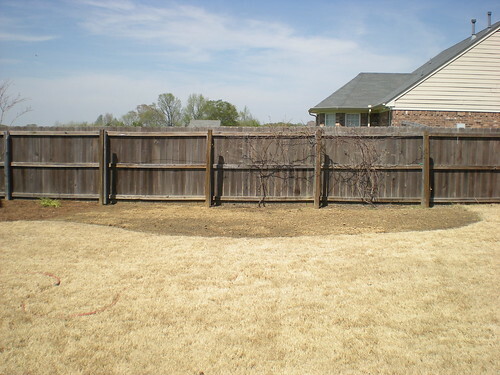 The two Crape Myrtles that anchor each side of the corner have been planted for 3 years this summer. There are 3 Morning Light Miscanthus in front of the Dwarf Burford (screening a cable box). The shrub closest to the right is a new Southern Living shrub its Twist of Lime Variegated Abelia…it was a freebie and a test plant from the Stockyard. 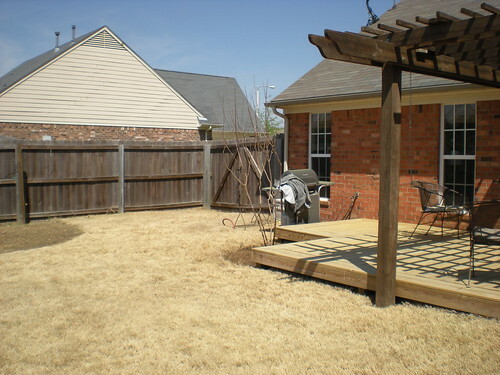 On the left side, Muhly Grass and Stellas. In front of the bird netting is a new variety of Butterfly Bush, Adonis blue, it isn’t suppose to get quite as big as other butterfly bushes…we are waiting on another test plant called Low and Behold and it truly is a miniature butterfly bush. I take that back, all the plants in that section we got for free! The following is one of our favorite specimen trees, the Lilac Chase. Love them. They look like marijuana leaves and the blooms are bright purple all throughout the growing season. 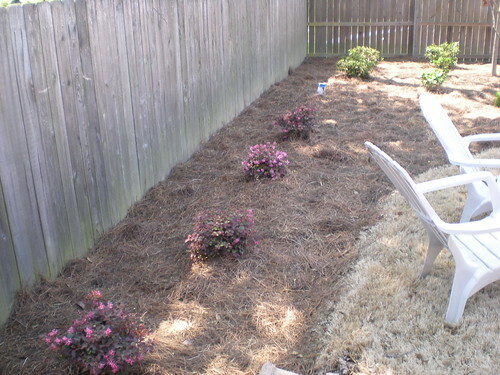 In the back corner, 3 George Tabor Azaleas. Two Invincibelle Spirit Hydrangea are on either side of the Azaleas, those are test plants (freebies) and also the new Hydrangea representing the Breast Cancer people. Between those two are two Blushing Bride Hydrangeas and one Twist n Shout Hydrangeas. Those three hydrangeas are of part of the Endless Summer group and bloom on both old and new wood. The Twist n Shout is brand new and is also the first lace cap…and is also a freebie and test plant for the Stockyard. Daphne Spiraea are in front of the hydrangeas as well as Gulf Stream Nandina on the right side of the picture. Stellas line the front of the bed. The tree on the left is another Chase. The tree in the middle is a Green Ash which we transplanted from the front yard when we moved in. One of my all time favorites: Double Pink Knockout Roses…and look at the blooms! We have 4 more our front and are covered! 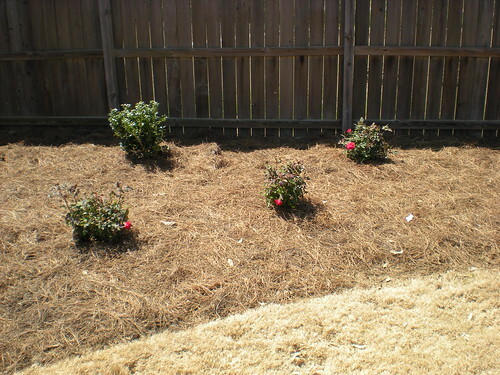 If you like roses and don’t like the maintenance, get these…mildew and disease free. And another fave of ours: Suzanne Loropetalum, maroon foliage that is evergreen…can’t beat that! Notice the hot pink blooms, they last from now until first frost. We are extremely happy with the way it turned out…we designed and redesigned until we thought we liked it. Then we met up with our growers who unloaded new plants with us to try and we redesigned with the actual plants as well. We are constantly getting test plants from the Stockyard and they like to know how they are doing and whatnot. 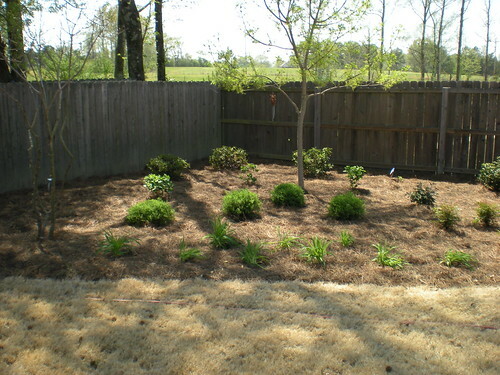 But anyway, my dad and Michael get most of the credit…I came in at the very end and helped with the pine straw and did all the watering…and I am still responsible for the watering…maybe one day we will have an irrigation system. 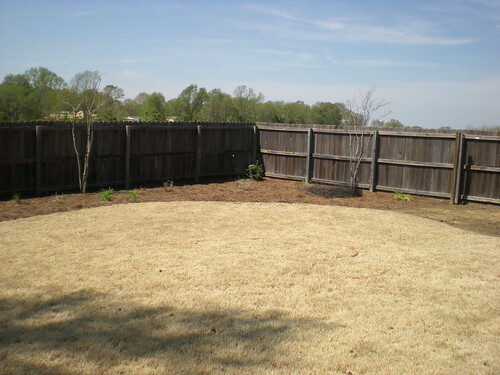 Hooray for a new backyard! Can't wait to see it in person! !